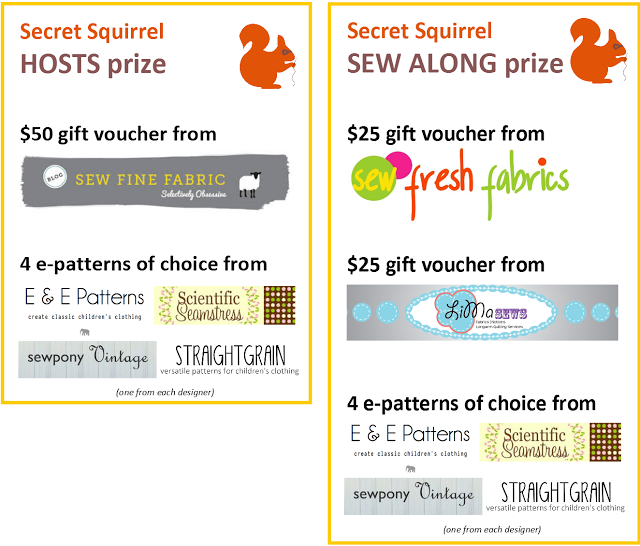 Secret Squirrel - its time to vote!! I hope you all checked out An's amazing colour blocked sundress - the final creation for Secret Squirrel. I love it and plan on copying it this summer (I hope you don't mind An)!! An and I were so impressed with all the creations made by our hosts and also in the sew along flickr group over the past year. Each host really embraced the series and came up with something imaginative and creative. So now to reward all that hard work we are excited to get the voting started for your most loved creations. There are two groups of outfits on which you can vote. The first collection is from our Secret Squirrel hosts. The second collection is for those who sewed along and added their creations to our flickr group. One vote per IP address. Voting begins now and ends at 12 noon Central European Time on Monday 7th July. Winners will be announced that day. To remind you of the prizes that are up for grabs here are our packages. Thank you so much again to our generous sponsors: SewFineFabrics, LimaSews, SewFreshFabrics, Scientific Seamstress, and Elegance & Elephants! Now, it's time to vote! Simply click (or tap) on the heart icon which appears on the picture of your favorite creation.The ent rant with the most votes per poll will be the winner. Thank you so much to everyone who took part! Especially our hosts: Venus, Tasha, Amy, Victoria, Jenya, Asmita, Annika, Saskia, Emily and 'Scary'. You made the series so much fun!